"For now, leave the larger groups to us." 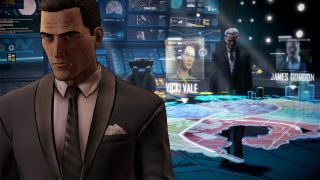 Telltale’s narrative-led slant on Batman arrives tomorrow, bringing with it Crowd Play—a new local multiplayer feature the Californian developer hopes will turn its games “into an event that you host at your home”. Starting tomorrow, it was revealed last week that the feature will appear in all of Telltale’s forthcoming games, however won’t support 2,000 players as first thought. Instead, between four and 12 players can huddle round the same screen and directly vote on game choices using their own devices, in turn “tailoring the story" as they play together. Phones are likely the best method of input, reckons Telltale, however laptops and desktops are also viable options. Telltale suggests players should leave larger group sizes to it, hinting at “special events” in the future aimed at bigger crowds. Interestingly, Crowd Play isn’t designed for streaming at this point—something it, on the face of things, seems cut out for. The post continues: “Crowd Play is not a feature intended for use over streaming services. There is latency introduced by services such as Twitch. This means that everyone isn't seeing that game at the exact same time, which means that everyone doesn’t see the choices at the same time.